Good news for local bikers. The story of Foley Motorcycles continues. One of the most renowned dealerships in Staffordshire’s future was in doubt with many saying it was due to close in October, however this is not the case & a new owner has been found. 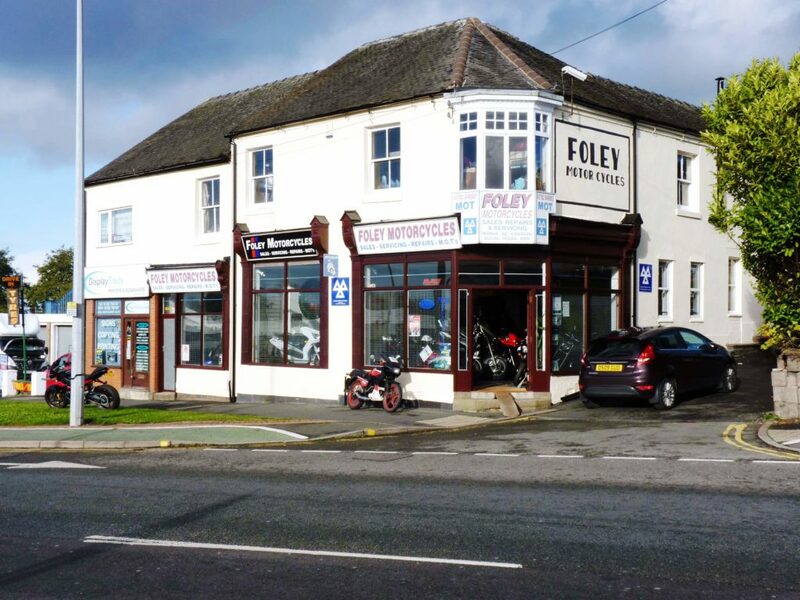 Service, repairs and spares specialist Foley Motorcycles in Fenton, Stoke on Trent, has changed hands. The company, founded in the early 1950s, has been bought by Andrew Standley, an engineer, classic bike restorer and motorcycle fanatic. Foleys prides itself on its parts business, and Standley is pledged to continuing the service for which it is locally renowned. Continuity is assured because previous owner Phil Martin will continue to work for the company part-time and because the staff of four includes parts guru Kevin Rushton, who joined Foleys in 1975. All brands are covered, with Yamaha (a former franchise) and MZ a speciality. The company’s engineering heritage – first recognised in 1975 when it was bought by Joe Martin, a keen motorcyclist and skilled engineer – will also continue. Standley is a retired RAF engineer who has since used his skills in the nuclear sector and industry generally and loves to modify BSAs, Two-stroke Yamahas and Hinckley Triumphs post 2005/06. Projects include grafting the twin-disc front end from a Honda CB750 on to his 1958 BSA A10 and using the front and rear ends of a Triumph Daytona 675 to uprate his 1956 A10. “I like to make them handle and stop properly,” he says. He currently owns eight machines, having whittled his collection down from a peak of 16. Aged 56, he was looking forward to cutting back work and enjoying his hobby when the latest venture came along. Although it is too early for Standley to have firm plans for the Foley business, he is determined to offer one or two apprenticeships – “proper apprenticeships”, he asserts. He is critical of schemes which involve invigilator inspections, preferring day or block release courses. Founded in the early 1950s by the late Frank Bentley, in Foley Street, Fenton, Foley Motorcycles soon outgrew the small premises and moved to its current location in King Street Fenton. Bentley retired in the 1960s and the business was sold to Joe Furnival. Known as Foley Joe, he ran the business through the British bike era until the Japanese took over as the main motorcycle producer. In 1975 Joe Martin, a keen motorcyclist and skilled engineer, bought Foleys. According to the company website, Martin “appreciated the need for a motorcycle shop to provide a good after sales service with spares and workshop back up. Joe started the long process of modernising and refurbishing the shop”. In 1976 Martin was joined by his son Philip, who worked mainly on the service and repair side of the business. In 1987 a large workshop extension was completed to further demonstrate the importance placed on the service and repair business, servicing all makes of bikes. After 21 years as a partnership Joe Martin retired, leaving Phil to continue to build up the business. Until recently, it sold Zontes and Motorini. Foley’s can be found on 67-69 King St, Fenton, Stoke-On-Trent & can be reached on 01782 848882. Tell Kev I sent you.